Jacqueline was born to a calico mother and probably that handsome orange tabby that comes and goes. Jacqueline has been in foster care since her 5th week because she has a special need: she needs to be kept indoors only. She has cerebellar hypoplasia which make her movement ataxic, jerky and leads to her falling. You might say it is causing smiles and laughter to watch her walk and run, bounce and jump: why she must be drunk! I assure you that Jacqueline is healthy in every other way and is such a love. And she is an independent sort which fits many a calico description! She has been spayed, vaccinated, dewormed, microchipped and is ready to go to her forever loving -and indoor only- home. 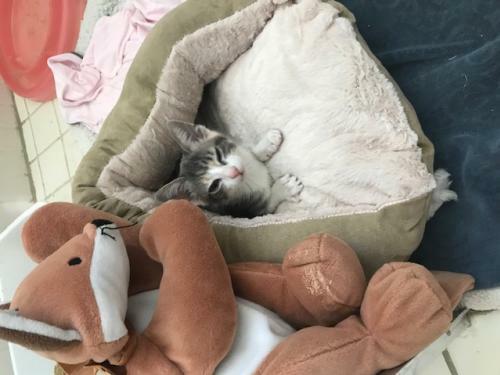 If you are interested in adopting this sweet and fun loving kitten please contact Antje at 562-212-7792 or email aljagd@gmail.com. A tax deductible adoption fee of $125 helps cover the initial medical costs.